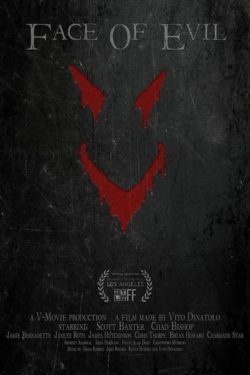 Review Fix chats with writer and director Vito Dinatolo, who discusses his new film, “Face of Evil.” Detailing its origin and creative process, Dinatolo lets us know exactly what makes this film a special one for him. In “Face Of Evil”, Private Jay Williams returns home from the Middle East to a surprise party thrown by his friends. As the party begins, his friends mysteriously become infected and attack Jay. Jay is joined by his ex-sergeant who reveals chilling classified secrets which may explain the origin of the epidemic. Together, they embark on a survival mission to find out the terrible truth. “Face of Evil” will premiere at the Downtown Los Angeles Film Festival on September 22, 2016.
Review Fix: What inspired your love of horror? Vito Dinatolo: I always liked horror movies, so it was inevitable that my first feature film would be a horror. From a directorial standpoint, I think with a horror or thriller you can express yourself better, show your style, and leave your footprint on the product. With comedy or action you heavily rely on actors and their charisma. For most genres, you need a star, but you hear of horror movies directed by such and such. Plus low budget horror is safer since it always sells. Review Fix: Why do horror films still matter? Dinatolo: As I said, you can shoot a horror on a low budget and sell them relatively easier than other genres. You don’t necessarily need stars and they can give the audience cheap thrills, even if the movie isn’t that great. It’s a win-win situation. The issue is that everyone is doing it now, so it’s gotten very hard to find a good needle in a haystack of crap. Review Fix: What makes “Face Of Evil” special and unique? Dinatolo: Despite its horror and action moments, “Face Of Evil” is deeper than many horror/thriller movies. It deals with topical issues such as veterans’ post traumatic stress, suicides, mass shooting rampages (what’s going on in a person’s mind before pressing the trigger?). This movie also brings up the paranoia afflicting our society in the 21st century, like fear of epidemics, of terrorism, of being spied on… even the fear of each other, all of which inevitably leads to mistrust and hate. Aside from those issues, which inevitablity simmer in the back of your brain, the movie is meant to entertain the audience without lecturing on social issues. All of that is accomplished with the help of a handful of men and women of goodwill who embarked on this mission with me for low or no pay! Review Fix: Why is Private Jay Williams an interesting character? Dinatolo: Because Jay is the average nice guy on the edge of flipping because of his PTSD. And what makes him even more interesting is how he interacts with his crazy friends and all the weird characters he meets along the way, starting with his ex-sergeant. Review Fix: Why should someone watch this film? Dinatolo: For the same reason why this film is special and unique – its topics and thrilling story, but also its characters – from the lead to the support and extras, they all did a great job… as did I for finding them! Dinatolo: I’m brainstorming a sequel or prequel to “Face Of Evil” and a couple of other ideas I’m not going to reveal yet, including a remake of a great 90s movie everyone would love to see again! I have a psychological thriller ready; it’s called “A Perfect Life”. I will also look for other scripts though. I like character based stories. If you notice, the most memorable movies are character based. Once you know the story, it’s no big deal anymore. But if the story is based mostly on the characters, not just on their actions, we will never get bored of watching those scenes because we are no longer interested in the story, but in their character – you want to meet them, hang out with them, say the same lines with them. Those movies are evergreen, and some become cult classics. Dinatolo: Oh, I can keep talking for hours about production, the story etc… But I suggest you go and watch it! If not at the Downtown Los Angeles Film Festival then hopefully the next one, or in theaters near you or online (as soon as I find distribution!). Then we can talk more, much more.